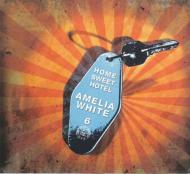 The road is a harsh mistress, and East Nashville's Amelia White knows that all too well. 'Sleeplessness and miles pile on the dark, moody new record, HOME SWEET HOTEL. Like most all singer-songwriters, Amelia travels to scratch out a living. The endless parade of coffee houses, bars and house concerts can overshadow any attempts to have a life at home with somebody you love. That tension is at the heart of her new record, produced by Marco Giovino (Band of Joy, Buddy Miller), with appearances from a wealth of stellar players backing Amelia, including multi-instrumentalist Sergio Webb (David Olney), Stuart Mathis (lucinda Williams) on guitar, Ron Eoff (The Band) on bass, Paul Gordon (the B52's) on keys and Julie Christensen (Leonard Cohen) adding some guest vocals.